Michael Massenburg was born in San Diego and raised in Los Angeles California. Michael pursued his studies at California State University, Long Beach and Otis College of Art and Design. 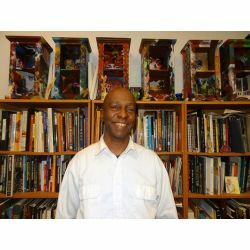 Massenburg has exhibited in galleries and museums, completed private commissions and worked on public art projects throughout the country and abroad. His list of public artwork clients includes Verizon, MTA Metro, ESPN, American Jazz Museum and the Fabulous Forum. He is also the recipient of various grants, including from the Los Angeles Department of Cultural Affairs and the California Arts Council. Along with his artmaking practices, Michael is a teaching artist, community organizer, and activist. for various organizations and causes.